Celebrating the art, passion, and culture of fifteenth-century Italy, THE MIRACLES OF PRATO brings to life the romantic story of the famed painter-monk Fra Filippo Lippi and the beautiful Florentine nun who was to become his muse, lover, and the mother of his children. The novel opens with a child born in secrecy at the Convent Santa Margherita and taken from his mother by the head of the church’s Augustinian order. The infant’s fate and that of his mother hang in the balance. Yet their story soon extends far beyond the convent, to the greatest power centers of Florence and Rome. Spiritual and sensual, adventurous and gripping, this epic story takes readers from the quiet cloistered life of Lucrezia Buti to the handsomely appointed chambers of the powerful Cosimo de Medici, from the birthing bed of a privileged Renaissance lady to the healing garden of a wizened midwife, from Fra Lippi’s private struggles to his public humiliations. Atmospheric and scrupulously researched, the novel conjures up a fascinating time and place, building on historical records to create a fictional account of a man so talented that both his patrons and the church patriarchs become pawns in a controversial struggle to keep him and his muse together. Like Fra Filippo’s paintings, this love story, set in one of the most intriguing historical periods, is suffused with clear, warm color and fine attention to detail. 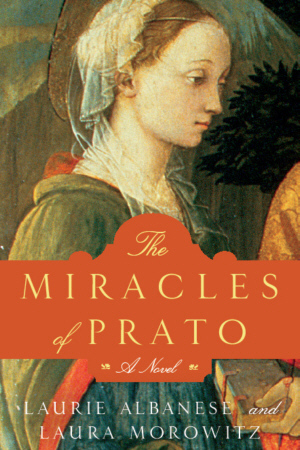 With painterly language and writerly skill the authors of The Miracles of Prato draw the reader into the lush, sensory web of Italian Renaissance color and forbidden love. An age-old story of the triumph of the human heart over rules, money and propriety is set against a back drop of artistic passion, overwhelming talent and stunning beauty. This is an enchanting story and will carry the reader away.